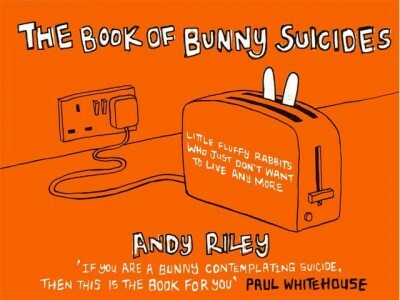 Andy’s first book, this is a load of drawings of rabbits killing themselves in vastly different ways. It was first published in 2003 in Britain, but it’s now been published in translation in over a dozen countries. As most of the cartoons are wordless, it’s a pretty easy ride for translators everywhere. It was the subject of a highly unsuccessful book-burning campaign in Oregon in 2007. Here’s some pages from it.